Forecast 100m Final London, will Usain Bolt win gold again? IAAF World Championships in London 2017, and again one big question is, who will be the fastest man on earth. It seems that there are the same protagonists as last year in Rio. Usain Bolt on his last big event and his challenger Justin Gatlin. The third man on the podium in Rio, Andre De Grasse, is injured, so there is place for new faces. One could be Christian Coleman who run to seasonal best this year, or Julian Forte with the fastest time in the heats. 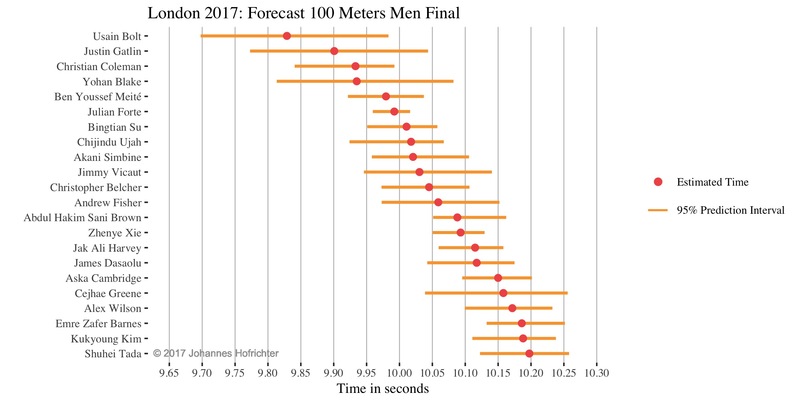 To get an impression who of the athletes have good chances to qualify for the final and which time they will run at the final, we take a closer look at the data (www.iaaf.org). 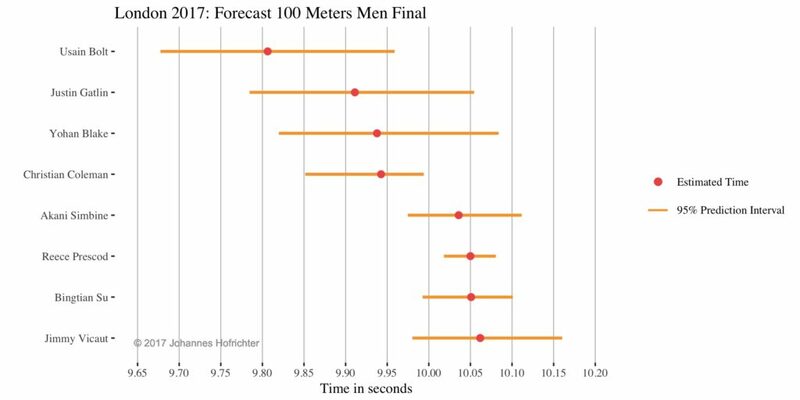 For each athlete we analyzed his historical marks to predict his time for the final. Therefore we used machine learning methods for the prediction. Usually we use a smooth trend over time, wind speed during the competition and some indicator variables as explanatory variables. These indicator variables notice if the competition was a final or not and if it took place at a World Championships (WC) or Olympic Games. 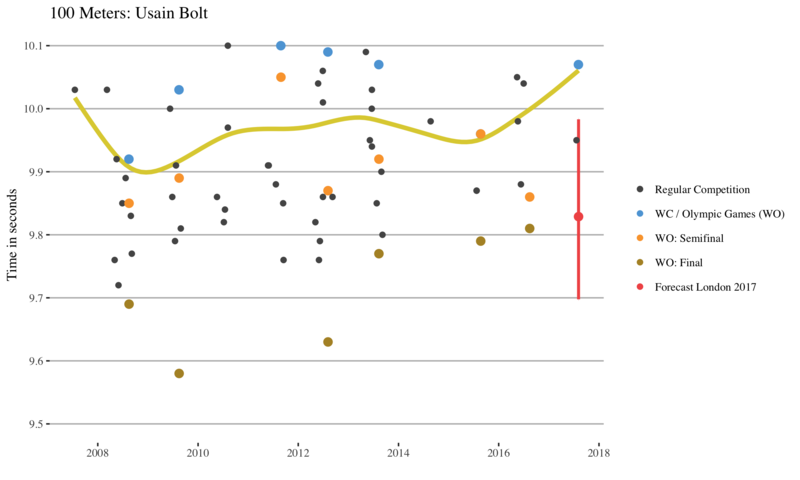 Let us take a look at Usain Bolts data. The yellow line represents an average smooth trend over time. The blue points are the time of the heats at WC or Olympic Games. Those are usually higher than the yellow average time. This indicates that he has not run at full speed in the heats as you can see at the last few meters when he turns his head and smiles to his challengers. The orange points reflect the time at the semi finals and are usually a little bit lower than the yellow average line. The golden points are the time of the finals and here it gets clear that at the finals he is considerably faster than usually. Therefore his predicted time for the final is 9.82, red point. The horizontal red lines represent a 95% prediction interval for this estimated time. 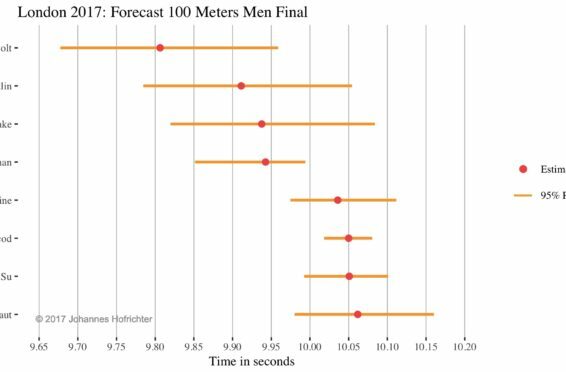 If we analyze the data from the other athletes in the same way, assumed that there is enough data available, we get a predicted time with a 95% prediction intervals for each athlete. These results are shown in the figure below. This figure shows that again Usain Bolt has the best precondition to win the final. Justin Gatlin seems to be his first persecutor and Christian Coleman and Yohan Blake will fight for the third place. Then there is a little gap followed by eight athletes (Ben Youssef Miete – Andrew Fisher) who have a good chance to qualify for the final. Then there is a second gap and all athletes with an estimated time slower than 10.06 will have to give their best to have a chance for the final. After the semi finals it looks like that Usain Bolt is again the favorite for gold but has a new young challenger, Christian Coleman. Justin Gatlin did not that good but the history shows, that he can push in the final for a better time. The fourth on the list for a medal is Yohan Blake. At 22.45 CET we will, see who will win gold at the IAFF World Championships at London 2017.